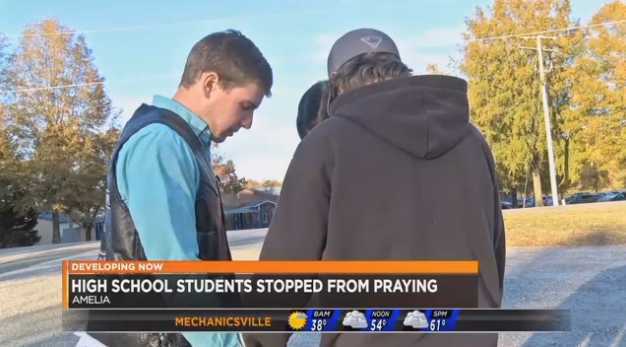 AMELIA, Va. (WWBT-TV) – Parents are outraged after a situation involving a group of students praying at school on Thursday. Amelia County Public Schools says it was all a “misunderstanding and miscommunication.” Superintendent Dr. Jack McKinley acknowledges to NBC12 that the four-year principal of the school stopped a group prayer that students began in the hallway, in between classes. “Moving forward together” – that’s the message on the marquee at Amelia County High School, just one day after a group of eight or nine students were threatened with suspension for praying during passing period. “There’s been a lot of hatred and aggression in our schools,” said Matthew Dunn. He organized the prayer.